The village of Agarak is located to the south of Mount Aragats, on the banks of River Amberd and covers an area of 200 hectares. A portion of which (118 hectares) has recently been declared a historical and cultural preserve by the government of Armenia. Across the highway near the village are traces of ancient settlements of different periods dating back to times immemorial. On a hill next to the highway there are flat reliefs carved out of the tuff stone by ancient settlers. Tuff is a relatively soft volcanic stone, which makes it easy to carve shapes and sculptures with primitive tools. 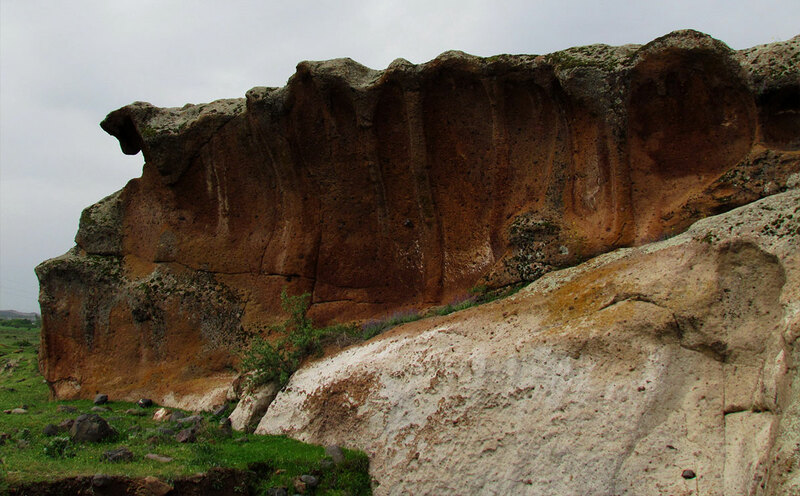 The ancient inhabitants transformed the landscape at the cost of considerable effort, turning natural masses of tuff into a gigantic system consisting of collections of stone structures. Armenian archaeologists have found numerous mysterious carvings at the site. On the gentle slopes of the hill, shallow pits are found in abundance, some of which are almost perfectly circular in a horizontal cross section. Next to them are impressive rectangular pits carved into the tuff stone. The sides of the cliffs and plateaus have also been carved. There are niches carved into the cliffs, as well as stair-like platforms leading to them. A necropolis was found at the site, next to a large area with religious and residential buildings of different eras. The earliest settlement belongs to the late Shengavit or the early Kura-Araxes cultures dated to the early Bronze Age, which in Armenia begun in 3400 BC a full millennium before the construction of the Great Pyramid of Giza. Armenian archaeologists have further excavated the remains of stone houses clustered along a street, together with a bounty of terracotta statuettes and ceramic artifacts. Archaeologists predict that further excavations at the site could reveal traces of an even older settlement. All of these structures, including an unbroken series of round, horseshoe-shaped structures and channels linking them, plus trapezoidal “sacrificial altars,” transform the natural landscape into a gigantic monument. It is unique in terms of its unusual composition and design, as well as its volume and area. The Agarak settlement is “multi-layered,” showing that people lived and build here in different historical epochs. Artifacts from the period of the Araratian (Urartu) kingdom have been found in abundance on the southern side of the hill. The large quantity of wine presses and wine storage vats discovered in the excavated sectors indicates the predominant role of viticulture and wine-making in the economic life of the ancient inhabitants of Agarak. As one of the most important points along the trade route leading from Ayrarat to Shirak and capital city of Ani, Agarak developed a flourishing economy and commercial sector, especially in the 3rd and 4th centuries BC and in the 2nd through 4th centuries AD. Evidence of this development is provided by the discovery of painted urban pottery, a drachm of Alexander the Great, a silver denarius of Octavian Augustus, and several signet rings found in sarcophagi burials belonging to the late Antique period of the site. Early traces of Christianity are also present at the site, predating adoption of Christianity in Armenia. A Christian burial dating from the 2nd to 3rd century AD was discovered there. The discovery of modest amounts of glazed and cooking pottery in the alluvium layer covering the plateau’s Antique strata indicates that life continued at Agarak in the high middle Ages (12 th to 14 th centuries). The final phase of the history of Agarak’s inhabitation is represented by the very modest aterial remains of the 17 th and 18 th centuries (ceramics, hearth bases, coins issued by the Khanate of Yerevan, etc.). The present utilization of the site can be understood only in the light of its entire historical development. Once it was a place for the creation and development of ancient thought, cult rituals, sacrifices, and an economically developed, vibrant life. In our day, parts of the site have been transformed into shrines, which by virtue of centuries-old tradition are still revered by the local peasants.